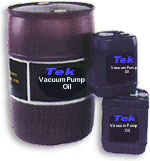 Tek-B is similar to our Tek-P however is has a much higher viscosity and resists oxidation and sludging. It is designed for use in vacuum booster pumps (blowers) or for piston pumps in heavy duty service. 55 gallon. Weight 439 lbs.